Teaching my clients of all ages, shapes and sizes how to live a healthy lifestyle is what I do every day. Focusing on small changes, realistic goals & expectations; small victories like improving one's HDL/LDL numbers, Hmg A1C or weight loss. However, lately I notice that people are getting anxious and obsessive about numbers and size, and have a hard time enjoying meals, outings and celebrations. Living your life obsessed with weight and food can become exhausting. It becomes isolating and unnecessary. Think about how much more joy we would have if we simply enjoyed healthy food and stopped feeling guilty all the time. 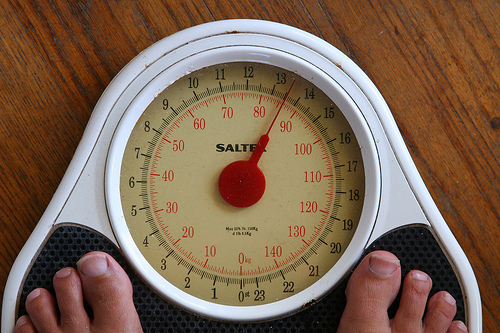 Ask yourself: What was your lowest weight and your highest weight as an adult? There are more chances to stick with the weight that is 10 pounds more than your lowest weight for the long run, rather than focusing on 10 pounds less than your lowest weight. Who is the leanest person in your family? If the answer is “you,” then you are doing pretty good. Genetics predict many factors and weight is one of them. If your siblings and parents are overweight and/or obese, you should set your goals more realistically and focus on improving your health, rather than focusing on numbers and size.